Steve: Steve and Jill here with Justin. Steve: Welcome to the Land Academy Show on this Friday, it’s a special Friday. I think this is the first time all three of us are doing it. Justin: It is, it is. 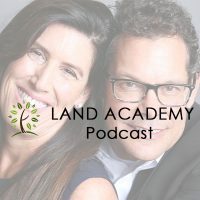 Steve: Here at tending Land Investment Talk, I’m Steven Jack [Butella 00:00:15], with guests, Justin [Slieva 00:00:17], and Jill [DeWitt 00:00:17], broadcasting from sunny Southern California and Dallas-Forth Worth. Today, Justin and I talk about Finance Friday with special guest, Jill, which is a little bit strange. Steve: I can’t even read it, it’s so strange. Jill: And comment now and then. Yeah, this is awesome. Steve: I’m gonna say some revealing stuff about Jill. Jill: Actually, it is nice. I understand the dialog. I understand, yeah I get it. It’s good. 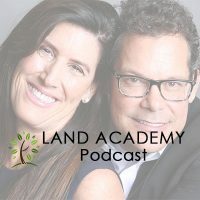 Steve: Before we get into the show today and I find out the deals that Justin’s doing and the stuff that Jill’s doing, let’s take a question posted by one of our members on the Landinvestors.com online community, it’s free. Jill: Do you want me to add? Jill: Oh, the new user interface. Got it. “What would be a quick and helpful way to get the number lots in a given area if that’s possible? Faster than searching county by county on their website, any ideas? Steve: Yeah, so the RealQuest API is literally the backend. CoreLogic API of parcel facts. Actually, yeah. I have a lot of experience using that. This will be solved, what you’re trying to accomplish when we release DataTree, access to DataTree. The searching function and the parcel checking function based on geography, even map searching it, is instantaneous. It’s leaps and bounds above what we use for RealQuest. However, the real value in RealQuest is it has, I think, a superior search function for land. Actually, Justin, go ahead and comment. I know you have experience with both too. Justin: Yeah. DataTree is ton of better on houses. It just leaps and bounds better on houses; but, when you get into RealQuest, they’re actually getting their lots down. It’s way, way easier to use than RealQuest. For someone who may have less than half the price on what the data is, it’s worth it for me to pay more on data in RealQuest, because it’s so much easier to manipulate with land. It works out for us a lot better. Steve: Same exact experience here. Exactly. So, with House Academy, which is just a couple of months away from release? Steve: The subscription to DataTree will be included much like RealQuest prop. Jill: Because, I personally would like to have a life. So, that’s why House Academy’s going to be not next week. A month or two. Justin: Are you missing date night? Jill: What’s that? I don’t know what that is. Justin: We literally have a meeting after we’re done recording this. We’ll show about how much we’re not going to work next week. Jill: And you know, this is so true. We have had, I’ll tell, you know [Omar 00:03:22]? One time, we were talking to our team about, I don’t know. We were just having a heart to heart with everything. Steve: You know, Justin, your kids are still real little, but, when they get a little bit older, it just becomes a sport to disappoint them. Steve: When they’re real little, you want to entertain them and play with them, and the whole thing. You won’t ever see them disappointed when they’re little; but when they’re teenagers, it’s a blast. Steve: We took him out last night, too. It was kind of a thing. Justin: He just never stopped talking. He just wants to be loved. Jill: That’s all it is. Steve: You know what? Give us a good kids’ story, when the kids were little, give us a good kids’ story recently. Justin: Oh man. I do a car show on Sundays sometimes, and my son wanted to go with me. I was like, “Yeah, sure.” So, I bought the Z28, because it had a backseat. My wife wouldn’t let me have the Cobra anymore. I’m driving, and it’s a 20 minute drive up there, and we hit some corners. He’s having a little bit of fun, we get up there. He wants a cinnamon roll so I give him half of a big cream cheese cinnamon roll. We’re eating it and I’m talking to this old guy. I go to this place because it has these old guys that kind of mentor me on business life and everything, because they’ve done it all. There’s about a hundred of them that show up on Sunday mornings at this little bakery. And I go, “Why?” The next thing I know, he’s projectile vomiting all over me inside this bakery. I’m like the horror. The older gentleman I was talking to, his name is Collin, he doesn’t have kids. He’s never had them- or, he has a daughter, but she’s long gone, grown. I was like, “Oh, heck no! Get out of the car.” He’s okay now, but that kind of has to do a little bit different look at what you’re doing and how you’re doing it. Justin: Yeah, no, it is. It’s fun. Steve: We get a lot of entertainment in that. Jill doesn’t see a lot of it. Jill: No, I kind of do, now that they’re older. Justin: Or with somebody else’s kid. Justin: No, it’s fun for us. Jill: Exactly, and then we don’t go to that restaurant again. Just kidding. Justin: Yeah, we go to ‘adult only’ restaurants. We sit at the bar. Jill: That’s exactly it. Yeah, it’s true. Steve: We sit at a bar that only allows 21 and older people. Justin: Yep, I get it. Steve: The food’s of standard. Jill: Yeah, exactly. I’m going to go to the restroom. I’ll be right now. Steve: You’re at that age where you do a shot of tequila when no one’s looking. Jill: That’s right, then go back to the table. Jill: That’s what I would do. Steve: What’s this show about? Justin: Yeah, we’re doing deals today. Steve: Today’s topic is Finance Friday with all three of us this time. This is the meat of the show. Justin, give us a rundown. Jill will do the same thing of, I don’t know, top three deals you got this week? Justin: Yeah, kind of a crazy week. I will say, I will thrown in, we always talk about our successes on Finance Friday. We talk about how we’re killing it with these deals. Sometimes, we pick a deal and green light it, and it doesn’t go through close. So, I had a couple of those that just had some hair pop up. I’ll give some highlights on some good ones. $40,000 for a property, it’s kind of a big in field lot in Rosewell. Asset value is like $280-$300,000. We’ve got it under contract. We’re going to keep running with it. So, it should close soon here, pretty quick. Couple in Florida, we picked up. It was actually from the Land Investors link that came through, where we helped out with that. Steve: These are big properties. Justin: Yeah, 18 and some change in. Closing, I think we’re going to be about right under 19, and comp them about $45-$48,000. Solid double. Those help investors change their life and that’s the cool thing about this. Had a few more. Had one pop up; we paid 10 for it. It has some timber on it. When we sent it to our big timber buyer in that area, he found something wrong in the GIS and the map overlay, it showed 2.34 acres versus 10 acres. We’re like, “Whoa.” So, those are the deals that keep us all coming back. We have a few timber buyers that are lining up. There’s five foot of snow to get there; so, we can’t really get across it. The timber guy rented a snowmobile, road up. He’s doing a timber cruise on it, and doing it that way. That’s kind of a cool thing. That’s the kind of stuff that we like to see. Had a lot of movement on deals this week. Had 4 get contracts that we had partners with, that we partnered on. Justin: On sales side, yeah. We’re seeing business pick back up. As y’all know, we just turn everything back into the business and fund more deals. It’s a good thing for all. Steve: We have an allocated fund that Jill and I personally started. She took money, I took money out of our separate stuff, and allocated. That’s what we’re using for 100% of the deals right now, and it’s no sign of stopping. That’s great. You’re the first member that I know about that is actively making this timber thing work. Can you just summarize that on a national, maybe on a Texas level, then on a national bases? Justin: Well, we don’t do timber in Texas. Timbers kind of a false sense of security for me. If that makes sense. I talk a lot about the exit. You’ll hear me say, “I want to know about how I’m going to exit a property.” Whether it’s going to go to a terms deal, or a cash deal. Timber gives me a false sense of security that there’s a commercial value attached to it too. Whether it is really, or we actually realize that it doesn’t, but for me, from an investment’s standpoint, I like that we see some special uses in that. We like it. You can’t just blanket, like, “Hey, this area has all this great timber.” Because, it could be pulp wood and you’re buying into something. The Southeast got really saturated back in the day, from Denis buying 40 acres and planting pine trees on it. That was going to pay for the kid’s college, and it never did. Steve: How much of it is subject to local regulation? Justin: All of it. Everybody has a different thing, and it’s subject to distance to the mill. You may have pine in the Southeast that’s not bringing any money. And then in the Northwest, it’s just going crazy. It just depends on- every commodity is area specific. Steve: So, what’s your advice to somebody new, bring in an expert? Steve: So what do you do? Jump on Google and see if there’s any value? Jill: That was my question too. I was going to say too, how much time and money are you spending on doing your due diligence here? Jill: You have to balance, because that’s what I’m doing here too, right now. I have to balance. Am I going to spend half a day on this? Because, it’s in the gray area anyway. I’m not sure. When you see some of our videos, they come back and big pine trees and cedar trees, it looks beautiful. Especially with a little bit of snow on it. You have that Hallmark feel. We look at it that way. We price and buy on the land value, and then we start looking at exit strategies from there. Steve: Let me give you a couple of ‘what if’ scenarios. Deal comes back from Land Academy member, it’s 20 acres in North central Michigan. It’s packed with trees. What do you do? Just on the dealer’s side. Justin: So, what we do is we’ll go parcel check fact access. Access from parcel fact. We move over to Lands of America and Realtor. They pull it up on the map. Get down to the parcel level, see what it looks like on a map outline, and start pulling back to see what the comps do on the land value, for what the market’s dictating. Steve: That’s exactly what I do so far. Exactly. Justin: Yep. So, we line up that. It’s not for us, it’s about land. We’re going to try to sell the land to somebody; whether it’s recreational property or not. Now, if we see a value, if something looks like it sticks out the hay, we may have the value for a commercial use. I know you all have talked about the recent podcast with some commercial deals. We get a pice of property. Kmart’s on one side and Walmart’s on the other. Hey, what strip mall wants to be right between that? Because somebody wants to drive off that traffic. Once you have the land value assessed, then you move to what the other ‘what ifs’ are, you know, and can you hit a home run with those? Steve: So, in Michigan, would you tax for timber? We look at land with trees. We look for high recreational property with trees. Go ahead. Jill: We started to go down that path too, in a house that we were flipping. Where everybody was talking about these palm trees. How valuable these dumb palm trees, it was on a half acre in Mesa. It’s long been sold. It was gorgeous. Jill: A lot of people were saying how valuable the trees are, but when the time came to it, nobody wanted them. I was reaching out everywhere, and just, we’re also not tree salesmen. I don’t want to be a tree salesman. Steve: Just a rabbit hole. It was a removal cost exceeds the value. Then we were looking at trying to donate them, trying to get the tax things at Arizona State University. Jill: Like, who cares about the stupid trees now? Steve: Somebody said it’s worth fifty grand. That’s what happened. Steve: And it sent us down this rabbit hole. Jill: I mean, how many tall, 50 foot tall, gorgeous trees. I really do believe they are valuable, but again. It’s not our thing. I don’t want to get caught up in it. It would be wasting all your time on these stupid trees. Justin: No. You’re exactly right. Me and my partner have had that conversation about velocity of money. Well, if we’re going to have to hold it til the snow dries, we’re just going to be stuck on it. What can I do with that 30 thousand dollars in the meantime? That’s when the velocity of money comes in. We talk about that a lot. We’ve talked about it in Finance Friday in the past, and Jill, if you start doing it with these guys, you’ll start seeing your partners want to turn down deals that make money. Justin: That’s the key part for all of this, for all of us. Whether it’s a Land Investor fund deal, if it’s a Plum deal, whoever. Let’s turn the money, because more money in deals means more money for all of us to do more deals. Jill: That’s the way we’ve run our business since the 90s. Since before me. That’s the way Steven’s always been and that’s been the underlying theme. Who cares, you know. When I came along, it was drilled down in my head. We are wholesale. I hope the next guy makes a fortune, or higher. Justin: Because he’s going to come back. Jill: Exactly. I’m not here for retail and hold their hand, and hang out for six months. No. Justin: Take the deal. Let’s roll. Steve: I can’t stand that. Jill: Well, you know that you often find too, we’ve all been in this situation. Shucks, I should have taken that first one. That was the best. The longer you hang on to it, you find that things happen. Like darn it, they have cash, they’re ready to go. Steve: Yeah. I’m dealing with that negotiation right now on one of the houses I’m in. If I tell you I hate houses right now, I hate houses right now. You have the pride in me on one side, then the investor on the other side. Justin: That’s the devil and the angel. I have to say my peace. I’m like, “Ah, [rarararara 00:17:14].” Do the deal. Look at how much time you put into it and how much energy. I’m glad we did the bathroom, but I’m still staring at the stupid bathroom now. I still haven’t. It’s dumb. I’d rather let someone else do it. I don’t want to be a contractor. Steve: Every once in a while, I don’t know what the numbers are like, we do a deal like that, where we get into it. We make a thousand bucks on it. It just keeps you honest, you know? If you had $80,000 on every property, imagine how fat and dumb you get. Justin: Yeah, you would, because you’d be celebrating so much and going out all the time. Steve: Just like, you’d stop paying attention to acquisition so much, and really looking at deals that you want to do and don’t want to do. Jill: That’s a show. Don’t make too much money, you will get fat and dumb. What the heck. Justin: Fat and dumb is okay, not today. Steve: I’m actually one of those sometimes. Jill: I don’t want to be fat and dumb. Steve: I’ll let our viewers decide which one. Justin: Our transaction person was working through a deal yesterday. She was getting angry about it. I sent her an email. She needed a response on something, so I sent her an email. She goes, “I just read your email.” It said, “Don’t be angry, because it might cause you to bloat.” Because she was getting so angry. She’s super fit; she’s sitting behind me in my office, so I just emailed it to her so she’s reading it right behind. She looked at me, she got upset. It’s a lot, lot of fun. Jill: Nice. That’s really cruel. Steve: Jill, what kind of deals did you get into this week? I know which kind, but tell us. Jill: I know, well, I like talking about something good and something bad. That’s kind of fun. A good one and a bad one. I’ve got this awesome 20 acres in Colorado, and you talk about trees, pretty parts of the country. I get excited when I see Colorado. I’ve never lived there, but I think it’s cool and I love it. I know that there’s a lot of value there. It’s 20 acres. We’re getting it for 7 and it’s worth at least 40. I know it’s going to go fast. Justin: What county is it in, if you don’t mind me asking? Justin: Okay, good. I was going to say, we ran into a deal. We had broker opinion of a hundred grand on a property. We paid 78 hundred bucks for in Colorado. It was in Huerfano county. Wildfire comes through, they put a 5 year stay on any new buildings. Justin: So, I say that. We ended up selling a property and made 25. We made three times our money on it. We did fine, but that broker opinion still hangs in your head. It’s like, “Dude, a hundred and ten thousand broker opinion.” We had it listed for 90, had a few calls, wildfire comes right up to the edge of our property, but they blanketed the county with the building permit restrictions. We talk about good and bad. We still made money, because we bought right. The acquisition’s side is what we’re taught. We buy right, we can still exit it, but we have that risk there, sometimes. Steve: Now’s a good time to bring this up. We are in the process of aligning ourselves with a company called, Land Advisors, which is the largest commercial real estate, national commercial real estate, broker. Jill: I was going to talk about it. Jill: No, no, no. You were doing it perfect. It’s great. Steve: No, you’re writing stuff down. Jill: No, no. It’s all good. So, go ahead. Steve: We’re trying to get some kind of special relationship, not so much reduction commission, but these guys have proven themselves since the 70s. We’re getting a lot of commercial real estate. We’re finding, I don’t know abut you Justin, but we’re finding ourselves green lighting more and more really valuable commercial real estate. During the acquisition process, you know. Justin: Yeah. No, you’re exactly right. We did that on a big portfolio we looked at. We brought in a broker that was specialized in that area, that knew the commercial in and out. That’s the cool thing about it. These guys love it. They’re not acquisitions people. They’re salespeople and that’s what they specialize in. That’s what our whole thing is. We’re acquisitions people. That’s where we make our money. Let’s put the deal together. Once we can all remember that, and not worry about the feel good stuff on the sales side. Remember your acquisition. That’s where you grind the deal at. Then we all are more successful. Jill: That’s it. I think for new investors, once you get rolling, you see that. Who cares when it sells? You don’t get excited, like, “Oh, that one sold? Oh, good. Okay.” I knew it. I knew that, but how it’s going to go? I really don’t care. I knew it when I bought it. It’s the best part. Steve: Two points. Two points in every deal for me that are fairly great points. Right when the deal comes in, and you look at it like, “Oh my gosh, this is awesome.” You get totally high off. I get high off of that. When you get the check, the bitter end. Everything in-between is just paper shuffling and a bunch of stuff, and talking. I got to go put it back to work. So, I’m like, “Ugh, needs more work. Let’s go.” It’s fun. Steve: At the moment, it’s just our money. What I look at, is our asset value. Right now, we’ll ship out, I don’t know, the numbers are close to 200 thousand, and what will come back is about 800 thousand when it’s all said and done. Let’s just say that takes six months. It’s very conservative. I think it’ll be a lot faster than that. There’s always one lingering problem in that. Always. If the vast majority of them just blow through, that’s hell of a return in a short amount of time. What the members are making is as much money as we are too. At 600 thousand, they’re making that margin too. Justin: We’ve opened that back up for them, with the service that both of us provided. It’s great to see that now, where they were stuck on the $500, $1,000 property to make two or three thousand dollars. They could step up and say, “Hey, I’m going to spend $7,000 and make forty back.” That person now has the possibility to make 20 grand. He didn’t have that before, she didn’t have that before. We’re going to take her with this 500 bucks on to what we can grow her business into. It’s a cool thing for us. Mom, married, four kids, is a schoolteacher. Going to prove that anybody can really do this. Steve: I love when underdog/unlikely person just pops up and just starts killing it. Justin: Oh, yeah. It’s awesome. Steve: Like it was in their soul forever, it just needed to come out. Justin: Yep. You unlock that beast in them. It’s great. It’s great. Steve: Do you have another property, Jill, or do you want to wait until the next Friday? Jill: I’ll do it next week. I’ve got some more to share. Steve: Landinvestors.com, it’s free. You are not alone. And you’re real estate ambition. Jill: Well, I’m not used to this. I’m not used to you saying it. Like, you’re on my- that’s my part of the script. I’m all confused. Steve: Oh yeah, that is. I’m all confused. Jill: I know, like, why are you, that’s my part. Hold on. Steve: Justin, plug your company. Justin: We got Plum Investment Group, casual Friday’s already out podcast. It’s Monday, Wednesday, Friday, and Land Mule, used to see us out there trying to sell land. Steve: And get your deals funded at Landinvestors.com. See you soon, Justin. Thanks.